Kalukanda House is just the sort of vacation home you envision when you’re in need of a restful retreat. The location is serene, picturesque and tucked-away, just 100 metres from a beach in Weligama Bay - yet you’ll enjoy easy access to a nearby town with restaurants and bars. The villa comfortably accommodates groups of eight, with an on-site team delivering impeccable service so you’re never left wanting for more during your holiday. Four luxurious bedrooms are spread out across the property. Each of the rooms are thoughtfully appointed, with canopy nets, quality linen, air conditioned interiors and ample storage space. A juliette balcony overlooking the garden extends out from two of the bedrooms, and all four rooms contain an en suite bathroom complete with shower recesses and Grohe fixtures. A study room on the ground floor may be converted into a fifth bedroom to house additional guests. A sparkling pool takes centerstage outdoors, inviting vacationers to cool off from the heat with a refreshing dip. Surrounding the pool are poolside loungers and beach towels, so you can dry off right after a swim and lay back to soak up the breezy tropical vibes. A cabana overlooking the pool is where guests sip sundowners, stretch out in a yoga asana or participate in outdoor Pilates classes. 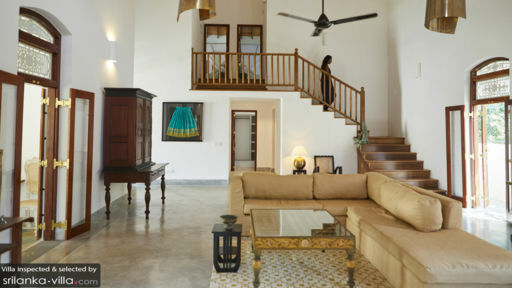 The living spaces at Kalukanda House are light-filled, lofty and welcoming. The decor balances style and comfort, and features a selection of furnishings and crafts made by local artisans and craftsman. There’s a double height reception room, a fully equipped kitchen, study room, alfresco dining area and veranda. A TV set provides screen time, and there’s Wi-Fi connection across the property so you can connect with friends and family back home. Kalukanda House is staffed by an on-site team with a villa manager, chef, housekeeper, caretaker and nighttime security guard. A daily breakfast service is included with your stay. In-villa dining experiences for lunch and dinner are available at additional cost, as are on-site classes for yoga, meditation, Pilates and cooking. Your villa manager will readily assist with car rental and engaging a private driver. Please inform him of your request at least 24 hours in advance. 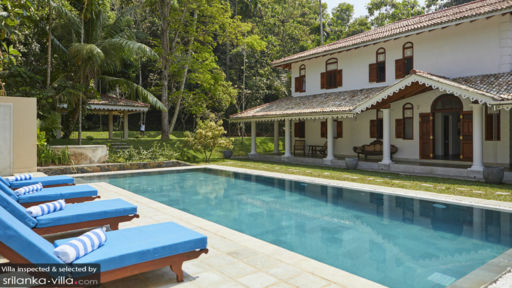 Kalukanda House is located in Weligama Bay, along the southern coastline of Sri Lanka. The coastal town is a renowned surfer’s paradise, but it offers more than world-class surf and golden beaches. There are yoga studios, high-end spa parlours, as well as a good variety of dining establishments. You’re also within half an hour’s drive to popular attractions like Galle Fort, Handunugoda Tea Estate and Mirissa Harbour. From your villa, step out along a quiet lane to Turtle Bay Beach (it’s just about 100 metres away). Weligama Bay, a renowned surf spot is about seven minutes’ ride away. Suitable for beginner and advanced surfers alike, the beach offers the best surf conditions between the months of September till May. While private yoga classes can be arranged at your villa, you may drop in for for a group practice at venues like Greenpeace Inn, Surf & Yoga Mirissa or Kosala Widhanage Yoga (at Gangarama Temple). Spa rituals are also a great way to unwind, and our favourite parlours include Cape Weligama, which features a menu of herbal steam treatments, massages and organic spice scrubs, as well as Quan Spa at the Weligama Bay Marriott Resort & Spa. The latter offers an extensive range of treatments including mani-pedis, wraps, scrubs, facials and more. Nearby dining options range from relaxed, unfussy beachfront venues to seafood restaurants and high-end establishments. Aloha Home & Kitchen offers European dishes and cafe fare in a casual setting, Blue Lagoon Seafood Restaurant serves up a wide-ranging variety of seafood dishes and Cape Weligama features three on-site fine-dining venues: Cape Club, Ocean Terrace and Ocean Grill. Spent 3 amazing days at Kalukanda House during the Galle Literary Festival in January. I usually stay inside the Fort so for a change I thought I’d stay somewhere quieter and honestly couldn’t have picked a better place. The villa itself is influenced by the ‘Walauwa’ style, (i.e. the style in which the homes of the local nobility were built) and is generally excellent. The pool is fantastic and there is an ‘ambalama’ (a shaded resting place for pilgrims built along main routes by the kings) in the garden that’s perfect for yoga sessions. Which brings me to my favourite part of the house: the garden. The property backs up against a cliff face and the garden has a mysterious feel to it. Very calming too. The meals, service, etc were all excellent. Will definitely go back again soon. Escaping the UK for a colourful, warm and delicious week in Sri Lanka may have to become an annual occurrence. Kalukanda House is a true delight and has been beautifully and thoughtfully designed as well as tastefully decorated with exquisite antique pieces, this is a special house. The high ceilings and colonial fans, the fresh fruits for breakfast, the G&T on the veranda looking through to the magical garden, an afternoon dip in the pool and the most delicious suppers from the chef made it hard to go out of the grounds and actually explore. The very short stroll to the beach for a swim or surf is a must and a Tuk Tuk is always on hand to zip anywhere you fancy… to nearby Weligama or down to Galle. I’d recommend an early morning visit to watch the fisherman bringing in their haul in Marissa. There’s so much to do, 1 week wasn’t enough. Kalukanda House has a real sense of calm and luxury… so you’re truly indulged in every sense. It’s a great location for exploring from but equally easy to just relax and loose some days feeling spoiled. 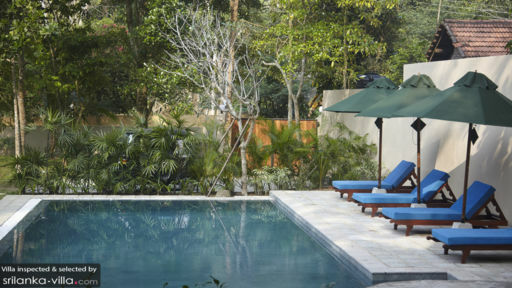 Kalukanda House is an oasis of calm and tranquility built to perfection to exquisite taste. As a yogi and yoga teacher, the garden was a perfect location to do my daily morning practice and lead a group through the practice. The calm, tranquility and nature surrounding the house facilitates for the perfect meditation space. The pool a great way to cool of the warmth of the Sri Lankan sunshine. The staff were especially diligent and a keen eye to detail from our needs in the home to the magnificent local cuisine served daily. Truly a paradise awaiting to be discovered and explored. I highly recommend booking the entire house for your groups or trips.